Body image is something that most of us like to think about from time to time but many of us rarely take big steps to address. Negative body image can really affect your mood and how you see yourself on the inside as well as the outside. I’ve been scouring lots of articles about body image and I’ve compiled what I think are the best tips to improve your body image that I’ve found. I hope that you find them as helpful as I have! 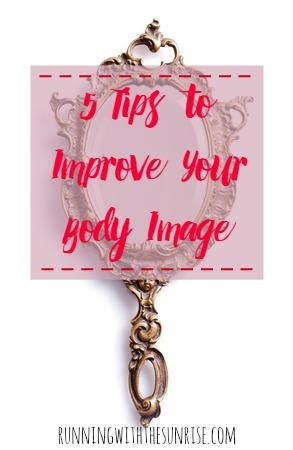 Need some help improving your body image? Try these 5 stellar tips! What’s something that you can improve about your body image? Do you use any of these positive body image tricks? I love all of these tips, especially number 4! I ask myself that all the time. It really helps to give me perspective and see how hard I am on myself vs. how understanding and empathetic I am when it’s my sister or a friend that is struggling or down on herself. I saw a blog post yesterday about affirmations and how they aren’t always helpful but I definitely disagree – I love them! Words are powerful on their own and positive daily reminders can be so helpful and mood-boosting. I often complain to myself about my legs and recently started trying to turn that around by reminding myself that my legs carried me for 26.2 miles. Turning the negative thoughts about the way my legs look into a positive that is unrelated to appearance has helped for sure! Yes! Love it, exactly! Turning the negative around to a positive is key! Love this. Love you. When do we meet. It took me a long time to rehab my body image. Not because I was necessarily negative about it, but more so because I didn’t see it for what it was, if that makes sense. When do we meet? Not soon enough! That totally makes sense. We have such skewed versions of what we think we look like when we’re young. One of the other things I realize I have to do is not engage in negative body conversations with other people. As a woman I think it’s easy to complain with other women about your body, and by both avoiding, and shutting down these conversations, it’s easier to improve your self image. Yes! This! I think we get it ingrained in our heads that negative body talk is something that we have to do, but it’s not! Kudos to you for breaking the cycle! Great tips. I am working on accepting compliments. Accepting compliments graciously is so tough! I think a lot of women are used to talking badly about ourselves because saying those bad things is a way that we bond. (Hello, the scene from Mean Girls where they’re all standing in front of the mirror telling each other what they hate about themselves.) Being able to accept a compliment is such a good thing to be able to do! Another great post 🙂 I’m not very good at meditating, but I know how beneficial it can be for just about anything! Thank you so much, Jess! I have some days that I struggle a LOT with meditating, too. It really takes practice to learn how to turn your brain off.